The Holiday Edition of Radio Free Charleston is online for your viewing pleasure now! This episode features Christmas music from Clownhole and Melanie Larch, a cartoon holiday extravaganza, lots of animation, and me, looking like a demented elf, hosting from The Purple Moon, on Lee Street. I need to thank Chuck and Connie Hamsher of the Purple Moon for letting us shoot our host segments in their store. Their shop is just packed full of the coolest stuff in the world, and it was fantastic having the “aluminium forest” of Christmas Trees in the background. It was also a kick because, for the first time ever, we actually had permission to shoot our host segments. We’re moving up in the world! Our second musical guest is Melanie Larch. Mel is a legend of the local musical theater scene. She’s been singing with the West Virginia Symphony for the last fifteen years, and will be performing the role of Mercedes in the WVSO production of “Carmen” next spring. Melanie is also a key part of the RFC team, having directed a couple of episodes, run camera on many segments, and she’s also the singer of our jingle. In the interest of full disclosure, she’s also the host’s main squeeze and writing partner for “Animated Discussions.” We took Mel out on the fire escape at LiveMix Studio and had her perform Schubert’s “Ave Maria” acapella. After being more nervous than any other performer that we’ve had on the show, Mel nailed it in one take. The segment came out so good that it was almost too classy for the show. We have a special holiday episode of the devil cartoon, featuring a radio remote originating from the trailerpark. 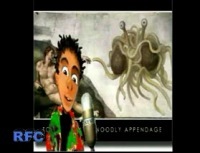 Watch what happens when Timmy, Satan’s neighbor, gets his hands on the microphone. There are also talking Christmas trees, extra animated bits, and during the end credits, a very sloppy rendition of the Radio Free Charleston Theme Song, performed by the Charleston Playhouse Quartet on the same night that the Clownhole performance was recorded. You can see me, Jim Wolfe, John McIntyre, and John Estep. Oddly enough, this was the only time that the quartet peformed as a four-piece. The joke was that we called ourselves a quartet, but never had fewer than five members. We probably could have used a couple of extra guys that night. At the very end of the show is a bad pun that will amuse Ann Magnusun, if she ever sees it. That’s the dirt on the holiday edition of RFC. Hope you enjoy it and hope you have a happy holiday season. How much I enjoyed “Ave Maria”!!! Great footage and audio quality. Incredibly beautiful and touching vocals. Another fine show. The segment with Melanie came out of nowhere. You were just bopping along with your usual irreverent show, and then this beautiful masterpiece dropped right into the middle of it. The Clownhole song was fun, and it was great to see the Purple Moon get some coverage. This show is a real holiday treasure. I WAS THERE! I was at the Clownhole Christmas show at the Playhouse back in 89. I never thought I’d see video from the Playhouse again. That was a rush. I even remember the quartet. Spectacular Christmas show. The animation killed me, and the classical bit was really classy. Melanie has an amazing voice. I wonder what people walking by on the street thought when you were filming that? Merry Christmas. Now keep making cool shows. Alright, now you went and got that damned song stuck in my head. I watched the show last night as soon as it went up in the corner of The Gazz, and all day long “Fa La La La La La La La LA” has been running through my head. How about giving us downloadable MP3s of these tunes? Then we can inflict them on others. Great show, but then you probably already know that. “Ave Maria” was so good it almost turned me Catholic…..almost. You continue to amaze. First you give us footage from the legendary Playhouse, then you knock us out with that killer “Ave”. I like the idea of MP3s of the tunes. This is the best Christmas present I think I got this year. Why is the Gazette hyping this show out the wazoo? Somebody sent me a link to this, and I admit I was skeptical. I decided to try it out, and I was amazed! The performance of “Ave Maria” by Ms. Larch is phenomenal. The rest of the programs shows off a very high level of creativity. Your city should be proud of itself for having such talented people representing you on an international forum. Finally! A female performer. I was beginning to wonder if you guys actually knew any chicks. Great show. Good balance of fun stuff and just a little churchiness. Why the paper doesn’t promote this show out the wazoo is a mystery to me. It’s too good be Charleston’s best-kept secret. This is the first RFC that I’ve watched since the Halloween specials. You really need to get the word out better. Great show. Clownhole sounds like they used to have a great future ahead of them. Was that the “Fairy Ghostmother” singing the classical thing? That sounded terrific and she’s pretty hot. The real star of the show is Little Tony, or whatever his name is, from Pentagram Flowerbox. Nearly made me soil myself. Cool stuff. You guys need to hit it big so that we can start telling you your old stuff was better. IS very good show. Saw the link on message board, good show, very good show. Radio Free Charleston is a lifesaver. Here I was, stuck working an 8 hour shift on christmas day, bored out of mind in the office all alone, and then I lucked into finding PopCult from a link in the alt.slack newsgroup. The holiday show is fantastic,and I’m going to work my way back through your entire archive to make my day go by faster. Praise Bob and pass the popcorn! Great show. Reminds me of the heyday of Night Flight with just the right mix of weird film and cool music. Good luck with this. thank you to queasy rider….his name is little timmy williams……..ya`ll visit the pentagram flowerspot blogspot and learn the rest of the story…….as it develops…..
Why does this exchange remind me of Clownhole in their heyday?